this extension forms a base, but how would you turn that in a living group? What is the most efficient living shape or the minimal living group you can build from that extension? Going out and simply making live groups is a recipe for loss. The time to think about life and death is during skirmishes. Then you want to live or get adequate compensation for sacrificing your stones. There are also times when you want to make an absolutely secure group for strategic reasons. You can think of this base --it is a base already-- as having an eye on the points plus the ability to expand. Of course, the points do not absolutely form an eye. Black may be able to take it away, but will normally pay too much for the privilege. If Black approaches White's base from the left, White can extend to the right, and vice versa. The points are not firm territory, but offer plenty of space for White to make life, if need be. White does not have to reply to with , but can always do so, and can similarly extend to the left if Black approaches from the right. This kind of vice versa situation is called miai. The point here is that we do not just look at White's two stones in the first diagram as they are at the time, but consider them as being as safe as White's group is in this diagram. In this diagram takes away White's extension to the right. With Black on both sides, there is a real possibility of losing the eye on the side. Black may jump into White's potential eye and then connect to one side or the other (another miai situation). 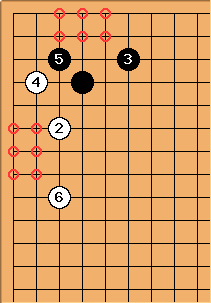 Very often in this kind of situation White will jump into the center, as here. Doing so gives White some elbow room. I realize that you have questions about tactics. Please see Defending a Base on the Side and other links from the Base page. Bill has already done fine work, but to add just a bit more... a stable group should have 1) ~6 points of eyespace, 2) access to the side, and 3) access to the center. The more these conditions fail, the weaker the group is. A two space extension is just barely failing the first quality under normal circumstances (in play). In Bill's example diagram, white has access to the side in two directions, so we can more easily forgive the first condition by making up for it double on the second condition. Both sides can easily access one side and the center, while having about six points (more or less) of eyespace available. Here both sides will play away since no more moves (locally) will easily threaten these groups.